Jesus Christ is the bridge between God and your best life possible. The secret is learning to walk in Christ. And walking in Christ is easier than you think. "I want a better life! I don’t know how to find it. I go through life so frightened. I don’t know how to shake this fear. I don’t know where to turn." "I keep looking for happiness and I just can't seem to find it." I discovered that a right, God ordained, self identity is the key to the goodness and happiness of life. It will give you the best life possible. It will give you happiness greater than you ever thought could be yours. And it can work for you. The experience of actually walking in the Christ Identity reserved for you will transform your life. It is easier than you think with the OK, GOD, Now What program. Why? Because your self identity determines what kind of choices you make and what attitudes you tolerate, seek after or reject. She had it all, or so others thought. Look at beautiful Whitney Houston; that gorgeous singer who committed suicide in a bathtub in a Beverly Hills, Hilton Hotel. What more could a young woman want out of life? She was a top singer and movie star making millions of dollars a year. She had cars, houses, adoration of millions, but who did she marry? Someone who would beat her up. She was into drugs, and in and out of rehab. She was in and out of church, but she never found the identity God had made for her. So, at the end of the day, what you are is meaningless. The key is who you are. Are you a victim looking to be victimized, or is your self identity found in the God of the Universe, with the power to overcome and bless anything …through you? That is the purpose and identity we are made for, and that is strength and blessing right from God. And that is the core message in the New Testament; and the core message in OK, GOD, Now What is to show you how to make that awesome Bible message work, produce wonderful results, for you and yours. And so can you. It is easier than you think, with the OK, GOD, Now What program. Have you ever been disappointed in life so that nothing looks alive to you? How about when you did not make it on a certain team, or that boy or girl you desired so much, would not even talk with you? In OK, GOD, Now What you’ll experience chapter after chapter of the will and desire to be alive, free from frustration and disappointment, and the release of God’s strength within you and how to move through the challenges that life throws at you, the highs, the lows and the frustrations that can cause you to want to quit along the way, and the gift of strength when you don’t. And so can you, and it is easier than you think in the OK, GOD, Now What program. 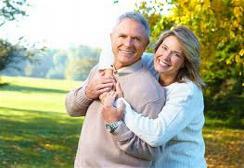 Beating Bitterness: Let's talk about Patty, who is a grandmother with two children and 8 grandchildren, and she lives in Bristol, VA. And she is now starting to see the hand of God in every part of her life. But that is only recently. She had been married to the same man for over 60 years, and he had just died. Her children had both been divorced and remarried with mixed families and many complications. She had raised her children in church, and her son was even an ordained minister, but their lives sure lacked the love and power of God. What had gone wrong - wrong with them and wrong with her? She was getting madder and madder at God. Why was all this happening? Why, why, why? God did not give her answers right away, or if He did, she could not hear them. But Patty did read OK, GOD, Now What. A friend had said, “You need this. Don’t argue, just do it for 6 months.” As she read the teaching section, she could actually feel the love and strength of God come into her. She especially was impacted by Chapter 11, Understanding the Power of Right Attitudes. OK, GOD, Now What - Whitney's & Patty's Stories. As Patty read she saw how she had let poor, best-guess assumptions diminish her life, health and joy. As she read truth, Patty started to feel hope again, good could come out of all this. She loved all the scriptures so she knew this was not just a pot of good sounding, but useless ideas. Truth At Work: Then Patty started doing the Affirmations Magnets in section 2. They challenged her with grace, love and truth. She saw they were over 95% scripture but had never seen truth applied this way. She loved the first part of the Affirmations, A-Z, as they built her identity in Christ, and she loved the second section, Affirmations 1-60, as it dealt with finances and getting along with people in such a practical, yet biblical manner. She started to see herself in the love and power of God. Patty was able to forgive several family members and get peace back in her heart. She was excited again in Jesus. Her hope rebounded and she started to believe again. She started to see more answers to prayer, and others were coming to her to pray with them. She has new purpose and new joy. And she keeps doing the Affirmations no matter what. And her self identity has gone from victim to a champion in Christ. And Patty now sees the hand of God. And so can you; it is easier than you think in the OK, GOD, Now What program. For me, Donald, just like it did for Patty, the neatest thing happens as these Bible-Gospel Truths get written on my heart with constant repetition of the OK, GOD, Now What Affirmations Magnets. Over time my subconscious mind becomes reprogrammed to my new identity in Christ. Then as the events of life trigger my subconscious mind, God’s power, love and a right mind are triggered in my subconscious to help me walk in who I am in Christ. Power in Action: Thus when the guaranteed problems of life show up, or the incessant pressures of advertising or other temptations, instead of getting into limiting, fault finding and mind-numbing fear, I will respond knowing God is there and I can overcome in Him to bless myself and any other people involved. Thus my mind stays creative, open, loving and leaning on God, and I can operate in courage and strength to victory, no matter how long it takes. This is the power of Belief + Truth = Results. And just like Patty, I get to see the loving Hand of God in action. And so can you. It is easier than you think with the OK, GOD, Now What program. "Imagine for a moment that you had a resource from a successful businessman that spoke specifically to scriptural ways you could make significant changes that would impact your life positively. 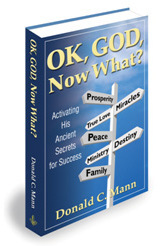 The book "OK, GOD, Now What" by Donald C. Mann is just that book. This is not your average, everyday, devotional book. It's also not a motivational book that you would find in a business section of your local library. It's the combination of both. It is filled with so many resources it's actually a bit overwhelming." Aaron C.
For privacy the names and locations of the real people have been changed.